The territory’s athletes enjoyed remarkable success in 2017, with finalists in every major competition for the first time in the BVI Athletics Association history, including the IAAF World Championships, where Chantel Malone finished seventh in the Long Jump. At season’s end, both Malone and Kyron McMaster, were ranked in the Top 10 in the world in their respective events—the first time BVI athletes have gotten such recognition by Track and Field News. At the Jr. level, medals were earned at the Commonwealth Youth Games for the very first time and at the Age Group level, an individual overall age division medalist emerged, highlighting the BVIAA Athletes of the Year, which has seen athletes recognized annually, since the 2009 season. Moving to the senior ranks for the first time, McMaster bagged his first Sr. Male Athlete of the Year laurels, with his stellar performance that saw him running the fastest time in the world in 2017 of 47.80 seconds over the 400m Hurdles. With the time, McMaster, a three times Jr. Athlete of The Year, became the No. 28 performer on the IAAF All Time List in the history of the event. During the season, McMaster ran three of the four fastest times run in 2017. He won the IAAF Diamond League Trophy at season’s end, after being disqualified in the IAAF World Championships for stepping on the line. In winning the Diamond League Trophy, he bested all the medalists from the World Championships. McMaster said awesome isn’t even the word to describe his 2017 season as some people would think their season could be better. Malone won her fourth Sr. Female Athlete of The Year honors since 2013 including a 3-Peat in 2013, 14 and 15—and fifth overall, after a season of highs and lows. She equaled her Long Jump personal best of 6.69m (21’11½”) during the indoor campaign before an injury knocked her down for two months in the season. She returned to competition by winning the OECS Championships in Grenada in July, with a leap of 6.67m (21’10½”) to secure her fourth successive IAAF World Championships appearance since 2011, then went on to join Tahesia Harrigan-Scott and Ashley Kelly who was in London with her, as the territory’s third athlete to advance to and IAAF World Championships semifinal. She finished seventh overall after cutting the sand at 6.57m (21 feet 6¾”) becoming the territory’s first World Championships finalist since the BVI began participating in the inaugural event in 1983. Djimon Gumbs capped off a magnificent season by becoming the BVI’s first Commonwealth Games medalist at any level since the territory began participating in 1990, when he earned a Commonwealth Youth Games bronze medal in the Bahamas in July. Gumbs, a double Carifta Games silver medalist in the Shot Put and Discus Throw in Curacao in April, launched the Discus 56.24m (184’6¼”) to secure his medal, after fouling his opening attempt. His winning throw came in the fourth round and says it meant a lot. Beyonce DeFreitas, the 2015 Youth Female Athlete of The Year, became the territory’s first Commonwealth Youth Games silver medalist, when she finished second in the 200m, to earn her first Jr. Female Athlete of The Year honor. DeFreitas earned her medal after running 23.88 seconds, .04 off her personal best. She opened with 25.01 to win her heat and ran 24.13 in the semis, where she was second. Jaleel Croal picked up the Youth Male Athlete of The Year crown, following his performance in the NCACA Age Group Championships. Competing In the 13-14 Boys Heptathlon, after holding seventh following Day I competition, J Croal settled for 8th place overall, after amassing 4101 points. Croal won a bronze medal with his time in the 80m dash of 9.37 seconds in winning his heat. Combined with Malaki Smith, who opened with an 80m victory for gold in 9.22 seconds, it marked the first time that two BVI athletes had won a medal in the same event in the history of the competition. Smith placed 13th overall. Akeela McMaster became the fourth BVI athlete since 1997, to claim an individual Pentathlon division medal at the North American, Central American and Caribbean (NACAC) Age Group Championships, formerly the CAC Age Group Championships, during the event held in Trinidad and Tobago in July. She also formed part of the territory’s fifth contingent to earn a team medal since 1990. McMaster claimed the 11-12 Girls Division Pentathlon bronze medal as the territory’s athletes walked away with six medals in its best medal haul in the history of the competition dating back to 1985, as well as a team award. McMaster joined Aliston “Al” Potter, 1997; Dione Blyden, 2003 and Beyonce DeFreitas, 2013 as the BVI’s overall division Pentathlon medalists. With performances in each event worth a certain amount of points, McMaster and Anguilla’s Cardesha Pemberton were tied for second with 2190 points heading in to the 800m, the final event of the Pentathlon. McMaster finished fifth in her heat and ninth overall, in 2 minutes 39.79 seconds, worth 470 points, while Pemberton only earned 271 points for 22nd overall in the event after running 3:07.32. McMaster compiled 2660 points in her five events for the 11-12 Girls Division bronze. McMaster began the completion by earning a bronze medal in the 60m dash with a time of 8.31 seconds. McMaster’s points and that of Ayana Findlay, who won and individual 800m bronze medal, earned them the 11-12 Girls Team Division bronze with a combined 5180 points. 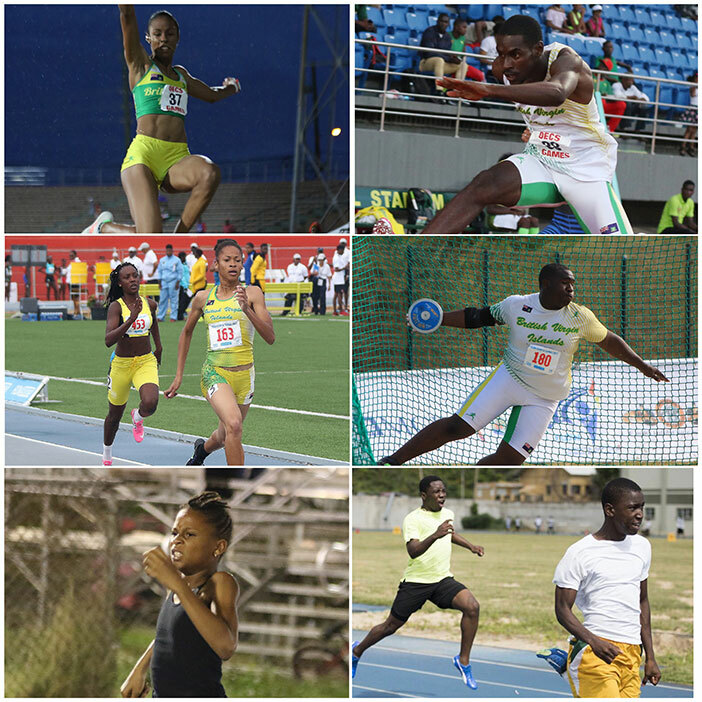 They joined Dion Crabbe/Leighton Smith, 1990; Dione Blyden/Jevonte Croal, 2003; Kanishque Todman/Britney Wattley, 2003 and J’Nae Wong/Arianna Hayde, 2011, as Team Division medalists.